If you have a weak stomach you might not want to read or view the following images, some might consider it gross but this is a part of nature. There are birds that expel pellets of indigestible bits of their food items, the pellets are also called bolus. The first time I clearly remember seeing a shorebird expel a pellet was this Willet at Fort De Soto's north beach and I happened to capture an image of it just before it fell to the ground. 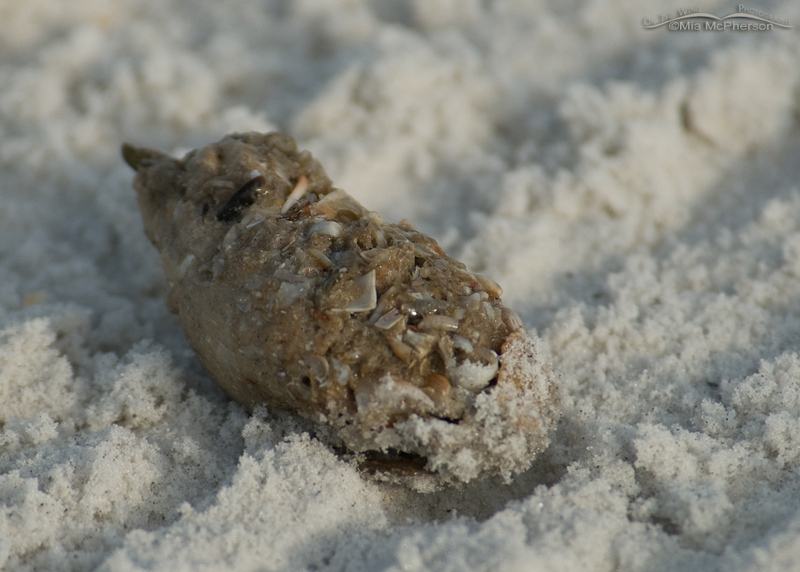 The pellet contained bits of sand, shell and what appeared to be the shell of small crabs or shrimp. 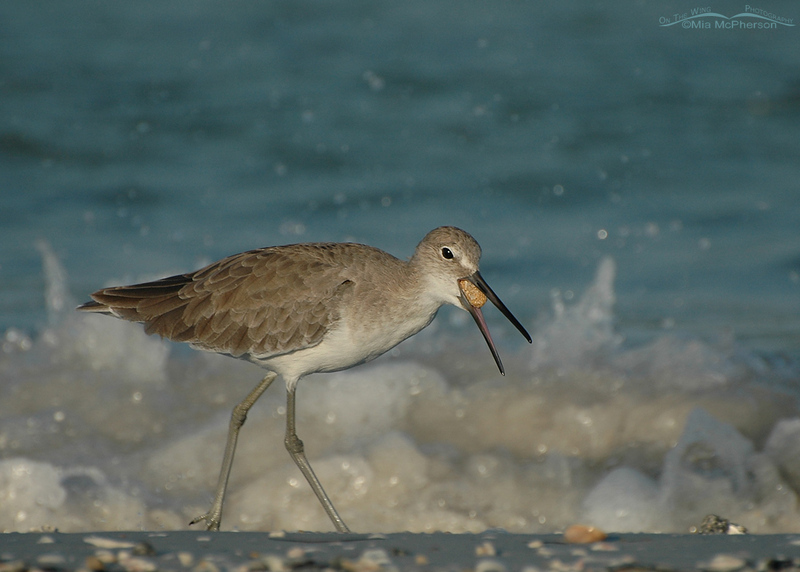 The Willet didn't even stop after the pellet fell, it kept on going down the shoreline. 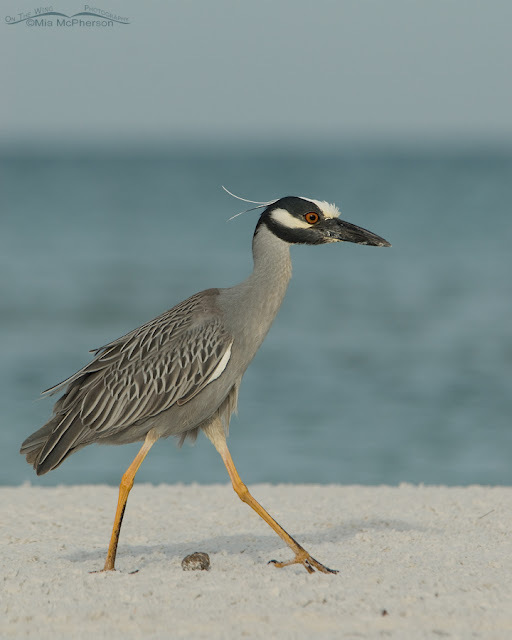 I came across a Yellow-crowned Night Heron one morning that seemed to me to be acting a little strange, it kept opening its bill and a watery solution was dripping from the nasal passages in the bill. 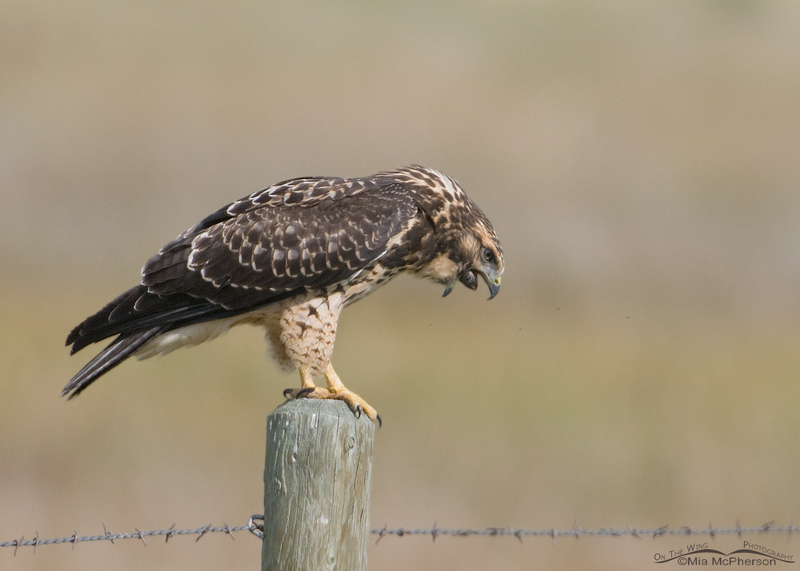 Soon it bent over, opened its bill and regurgitated a huge pellet. Almost immediately after expelling the pellet the Yellow-crowned Heron walked down the beach. After the heron left I walked over and took a few images on the pellet it had expelled. While I certainly couldn't make out everything in the pellet I could see pieces of shells in the bolus. One very cold January morning while I was photographing at Farmington Bay WMA here in northern Utah I noticed a Northern Harrier that didn't seem as spooky as most of them are and when I noticed the bird opening and closing its bill repeatedly I hoped it was going to expel a pellet. The light was bad so this series of images aren't the best but I was delighted to capture the action anyway. 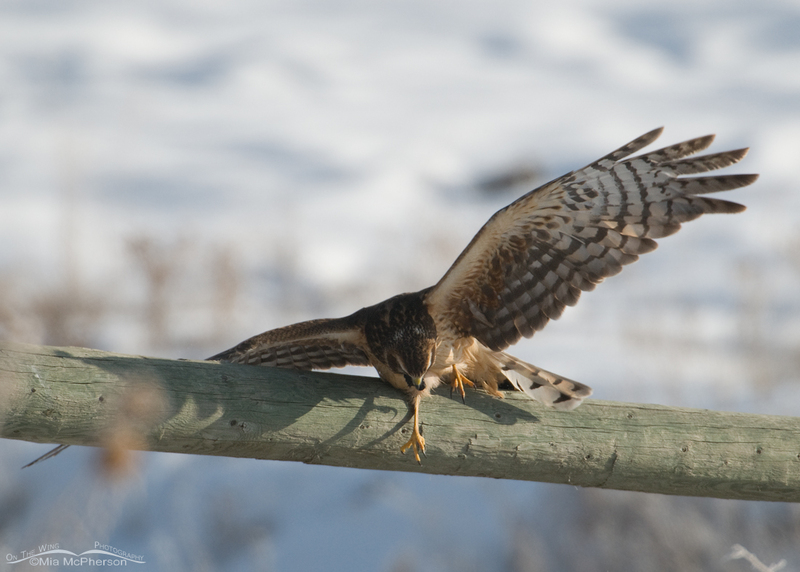 The Northern Harrier worked so hard at bringing the pellet up that it slipped on the fence rail it had perched on. 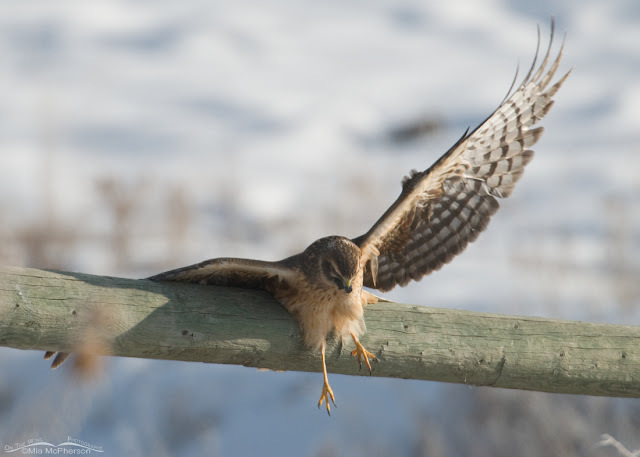 When I took this frame I seriously thought the harrier was going to fall right off the railing and that I might miss seeing the pellet expelled. The Harrier fluttered its wings, I could see the feet trying to get a grip on the railing and that the pellet was still in the bird's bill. Somehow the Harrier was able to get back on top of the railing and get its balance back with the pellet about to exit the bill. My camera's buffer started to fill up which slowed me down and I didn't get a shot of the pellet just as it exited the bill but this image shows it at the lower edge of the frame on the way to the ground. As I recall the harrier stayed on the perch for several minutes before it flew away. Earlier this year I spotted a Loggerhead Shrike that allowed a close approach out on Antelope Island State Park, I've learned that with these shrikes if I can get close to them without making them fly that they might be getting ready to let loose with a pellet so I waited. When the shrike started to repeatedly open its bill I knew I better be ready for the action because with shrikes pellet expulsion often happens quickly. Just two frames later I can see the pellet start to be visible. Two frames after the last image the pellet is nearly out. The very next frame shows the pellet dropping to the ground. 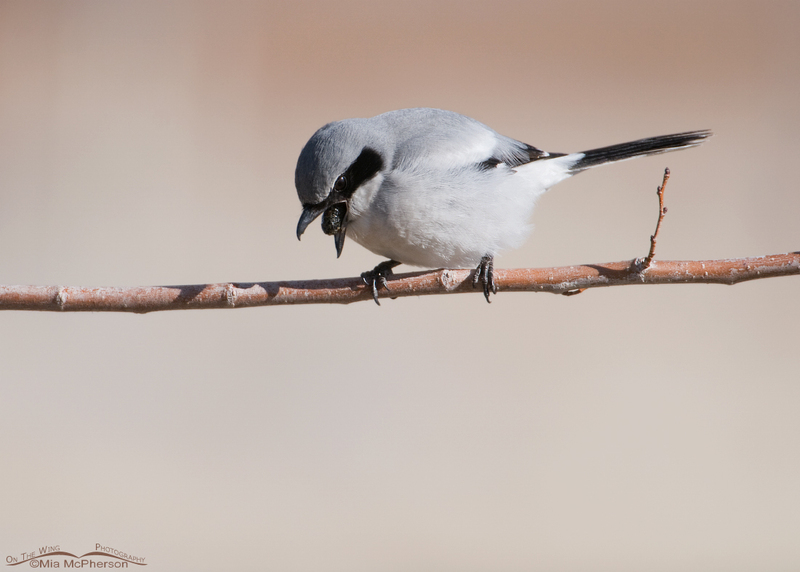 The Loggerhead Shrike seemed to need a bit of time to recover from expelling the pellet unlike the heron which walked away right afterwards. 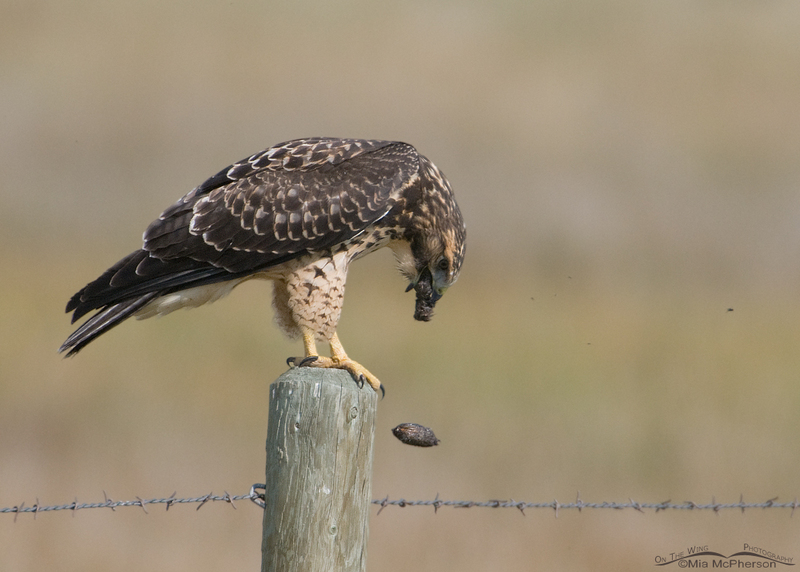 My most recent opportunity to photograph a bird expelling a pellet was last month in southwestern Montana in Beaverhead County. I knew where two juvenile Swainson's Hawk were hanging out along with the two adults and went to see if they were around. We found all four of them in their normal location but at least one of them was on the right side of the road for the light because on previous trips the birds were badly back lit. 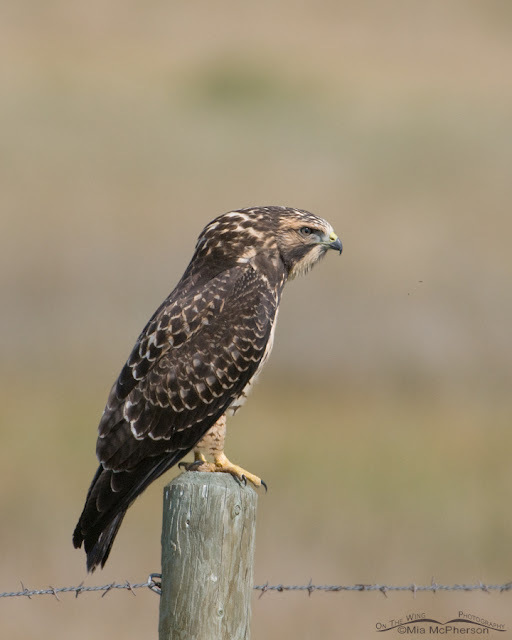 I saw a lump on the back of the neck of the juvie Swainson's and realized the bird was going to expel a pellet. 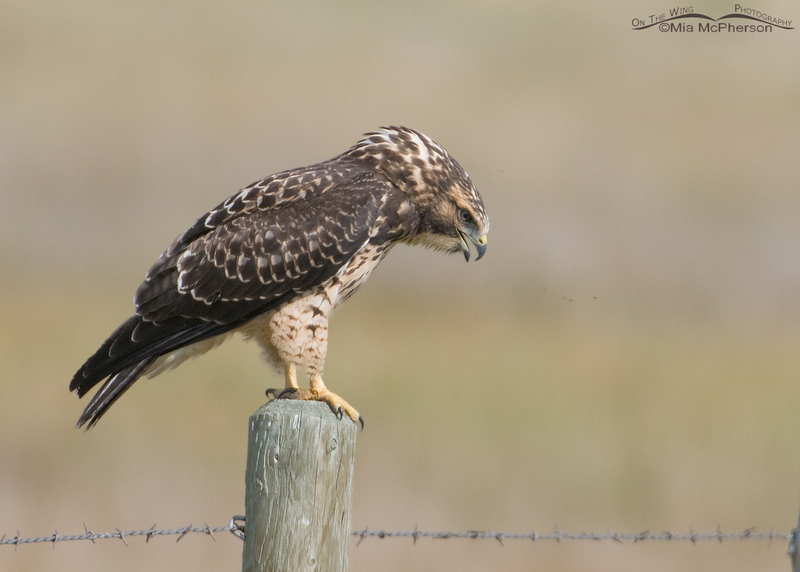 Not all birds get this lump but I have noticed it on other hawks often before a pellet is expelled. I was further away from the bird than I would have liked so these images are not the best of quality. Hopefully if there is a next time I will be closer than this to the action, it sure made me wish I had a 500mm lens with a 1.4x TC. The young Swainson's seemed to be having difficulty. In this frame the front part of the pellet is visible. As the pellet emerged I can remember thinking that it seemed to be pretty long. Look at how big this pellet was and combined with the first one that fell it was no wonder the neck of the hawk seemed so swollen before got rid of them. It took 4 minutes for the Swainson's to expel the pellets. 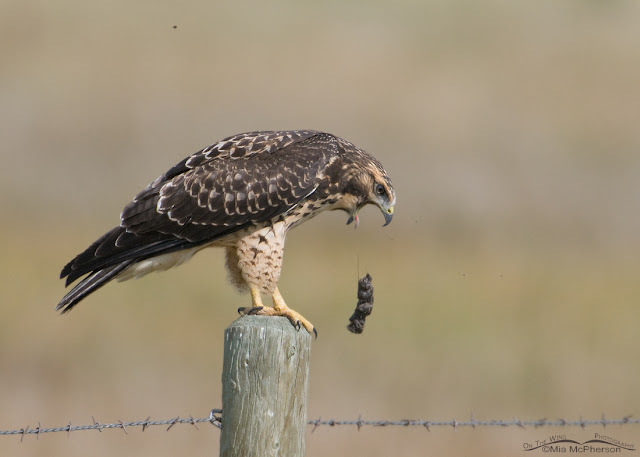 Much like the harrier above this juvenile Swainson's seemed to need time to recover from the process of expelling the pellet. 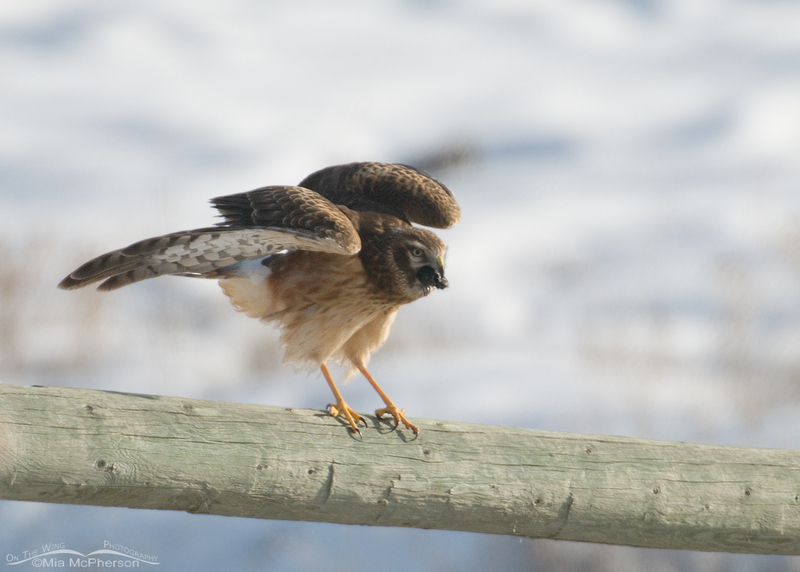 It stayed on the fencepost for several minutes then raised its wings, stretched and soon afterwards flew off. 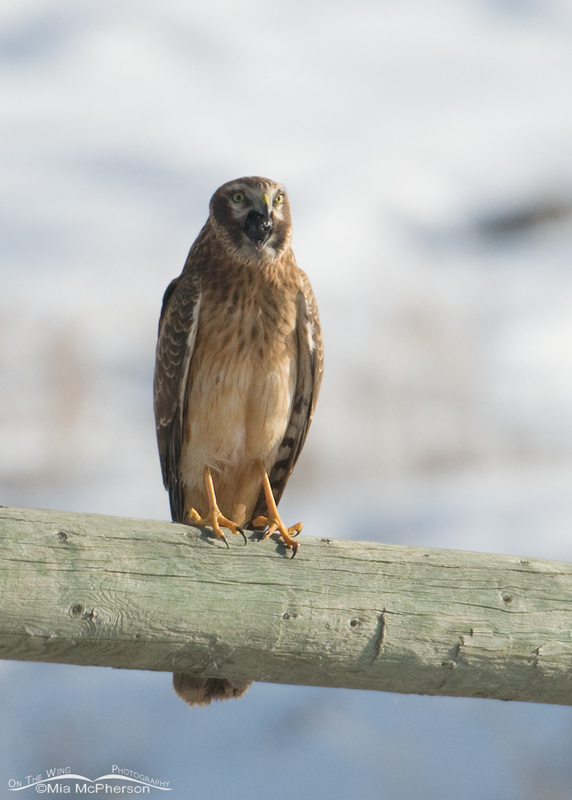 Perhaps it is more difficult for raptors to expel their pellets than shore or songbirds. 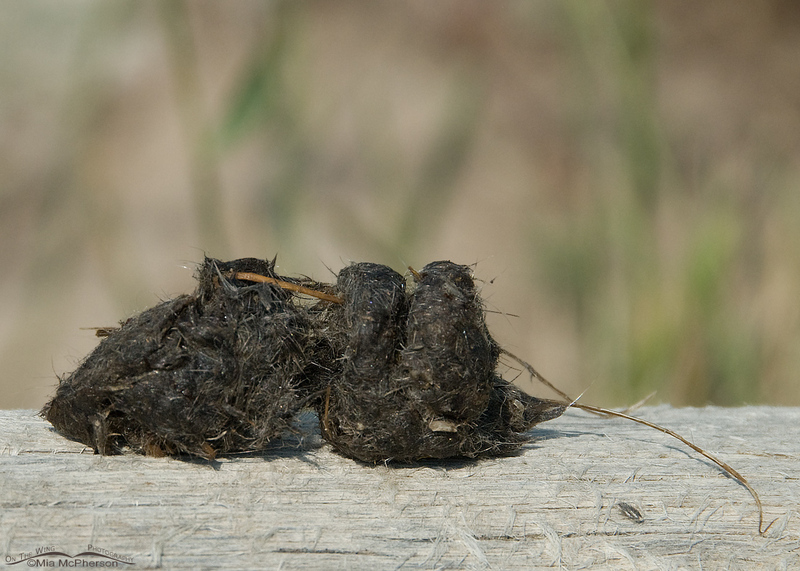 I did take some photos of the pellet after the Swainson's left, since rodents are a part of their diet I wasn't surprised to see so much fur in it. It also had some small bones as well. 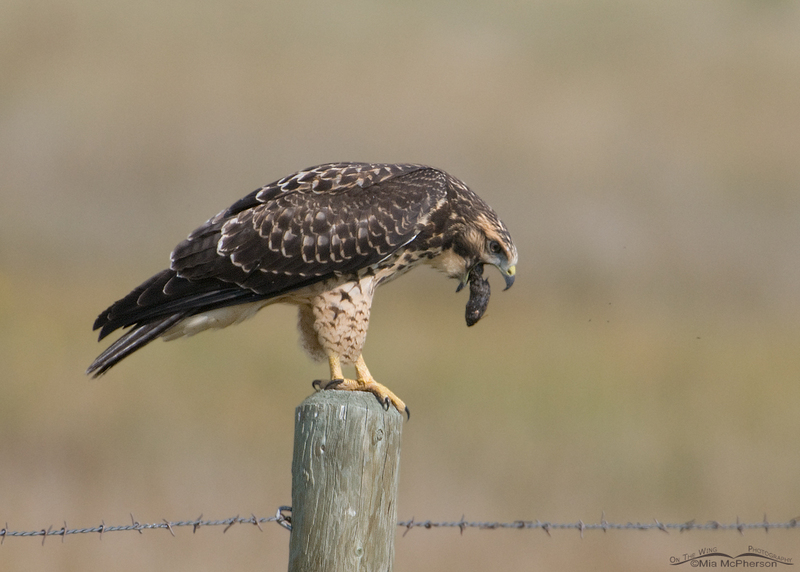 Next time you see a bird repeatedly opening its bill while perched or see a lump on the neck of a raptor you might want to stick around to see if a pellet will be expelled. It isn't pretty but it is downright fascinating! Neat post and great photos Mia. Something I have never witnessed, but will watch for . WOW! Talk about being at the right places at the right times! Amazing! It probably says a lot about who I am, but I just absolutely love this post Mia! I was even eating breakfast as I read it and viewed the incredible images. You make even throwing up look great! This is such a fascinating bird behavior and so glad that the world has you to help photo-document it! I'm with Robert - great collection of behavioral images Mia! Super super stuff Mia! Those birds must feel so relieved afterwards too. Great shots--I've never seen such excellent documentation anywhere else!. Astonishing shots, Mia! I wasn't aware of this behavior in birds except in owls. Come to think of it it makes sense. Wow, how do you manage to get these shots, Mia? They are amazing. Does this capture years of work? Just curious... Thanks much for sharing them! Wow, that poor Harrier wiped out hard! These are all great captures Mia! I've seen several terns cough up pellets, but I was never sure why they did that; thanks for the great info! Thanks for your comments everyone, I was slow to thank you because my mother was here in Utah and I spent every minute I could with her. 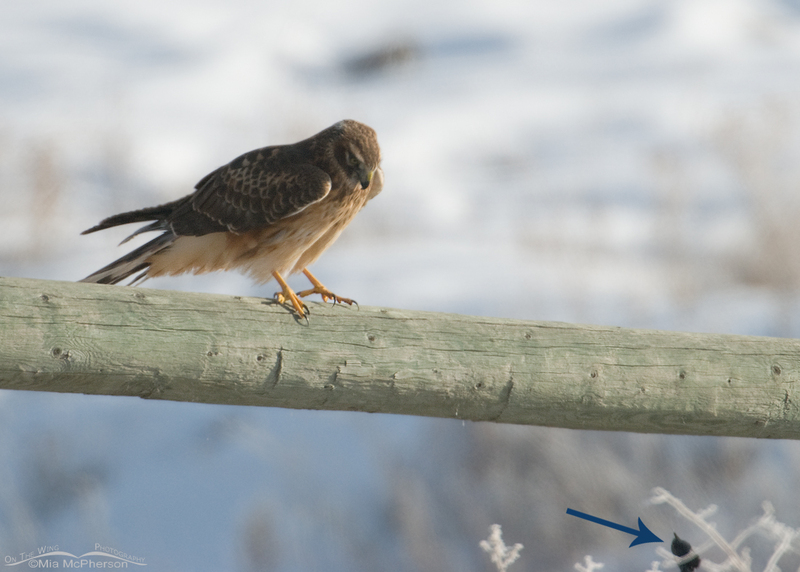 Getting these images requires observing the birds and knowing their behavior before a pellet is to be expelled plus the same patience it takes to be a bird photographer. Mia, this is an exceptional post filled with interesting information and superb photographs! 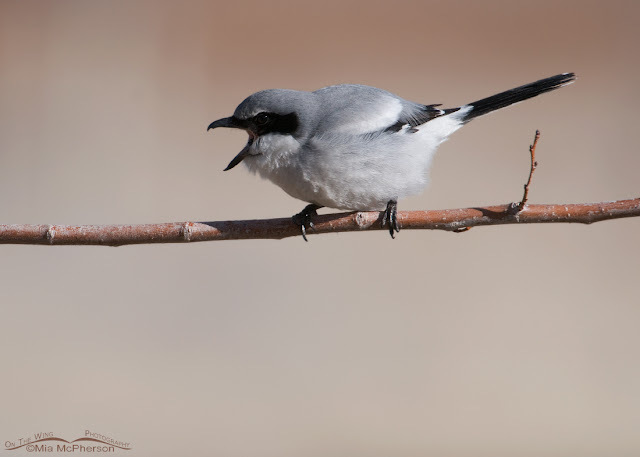 Your images show off bird behavior so very well. 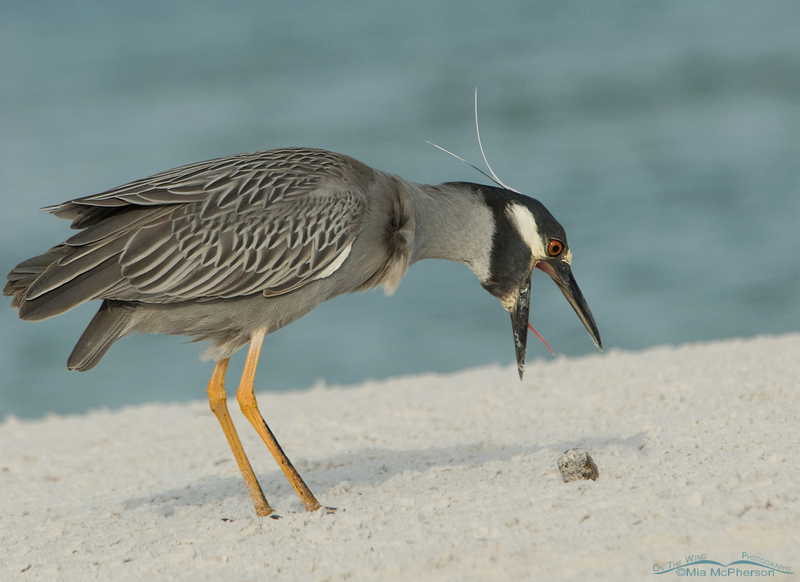 While in Florida last year I observed a Black-crown Night Heron expelling a pellet. This was the first time I had seen such a thing. I noticed it was mostly made up of crab shells. Very interesting! 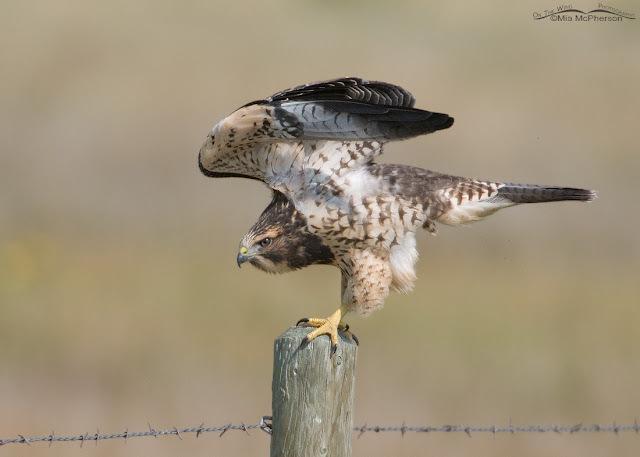 Fantastic shots, and from such a variety of birds! 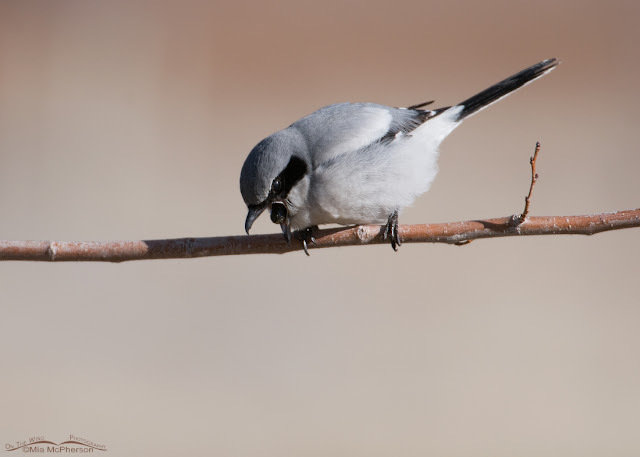 I only have bird-with-pellet shots of one bird--a Loggerhead Shrike. 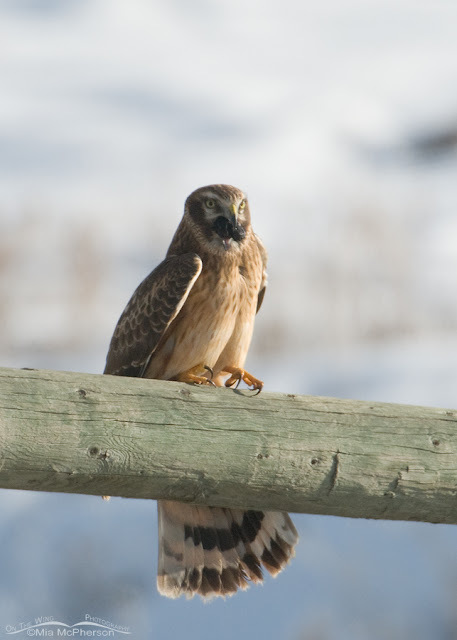 Cool birds and great experiences, love the photos.